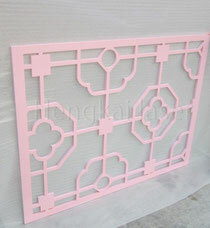 If you like wood art style to decorate home, please consider wooden screen by laser cutting. Now some clients prefer wooden decorative material to design restaurant, hotel, tea or coffee bar,etc. Above picture is one of designs for Chinese Restaurant. External panels include building cladding, balustrades, window screens and wall art. Materials range from thin aluminium for ceilings, through acrylic for privacy screens to thick stainless for balconies and balustrades.